Since the Trinidad and Tobago Computer Society (TTCS) has access to a OLPC laptop, I’ve been tinkering with it, updating the firmware and the operating system image file. 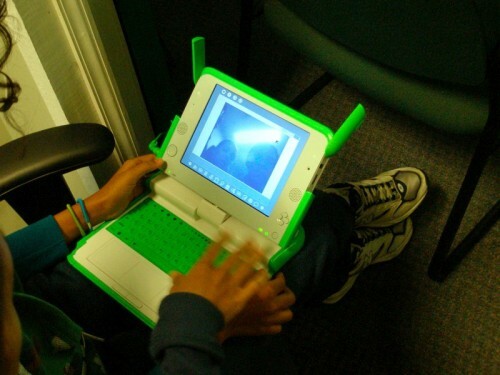 It has been shown at a TTCS meeting and you can see photos of the OLPC in action in Trinidad at the TTCS meeting. Until December 31st, 2007, one can get the OLPC under the Give One Get One program . However, when I tried to order one online, I encountered the same problem as CFR : you’re required to create a Paypal account and the online web form is meant for US and Canada donors. “If I live outside of the US or Canada, may I participate in Give One Get One? So, I called today (December 31st, 2007), gave my credit card and my P.O Box address in Florida and placed an order. It will be useful to have two OLPCs at TTCS meetings to demonstrate the mesh capability of the OLPC laptops. The official OLPC wiki also has lots of information ,both news and technical details about the OLPC.